16 people who worked in advertising were laid-off. How were their lives affected? What choices did they have to make? Are they leading happier lives since the layoff? 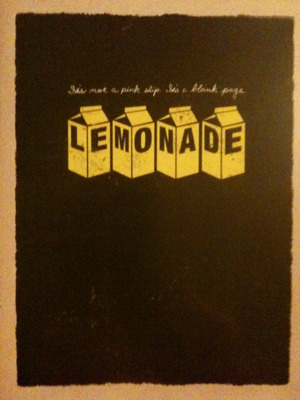 Lemonade provides the answers to these questions. It’s not a pink slip. It’s a blank page. When people lose their jobs, their first concern is predominately about money. Mortgages still need to be paid off, utility bills need to paid, and food needs to bought. In plenty of cases this is the only concern, as people worry about losing their home, and the prospect of having nothing. In many more cases though, being laid-off is the catalyst for life changes. A second car, underused gym memberships, holidays, and plenty of other non-essentials can be removed from the accounts. A more frugal life can be lead. Each person interviewed in Lemonade is happier (or at least perceives themselves to be happier) since being laid-off. We should all know that a job can be a prison for happiness, where monthly payments offset the unhappiness of doing the job, but also tighten the shackles of routine. The most powerful part of the film for me was when David Cohen described how losing his job was also him losing the last shred of responsibility in his life. He was able to lead his life as a woman and no longer have to fake his masculinity (or hide his femininity). I got laid off and I changed my gender. If you are unhappy in your job and you don’t have major financial responsibilities, explore new avenues, try new things, follow your passions. You never know where it might take you, and you never will if you don’t try.